M16, the Eagle nebula, and M17, the Swan (or Omega) nebula are massive hydrogen emission nebulae that are active in star formation. They lie approximately 6,000 light years away in the Sagittarius arm of the Milky Way. They are very bright and can be seen with the naked eye under dark skies. Color: 10 @ 5 min. Processing: The Ha images were reduced, aligned, and combined in CCDSoft. 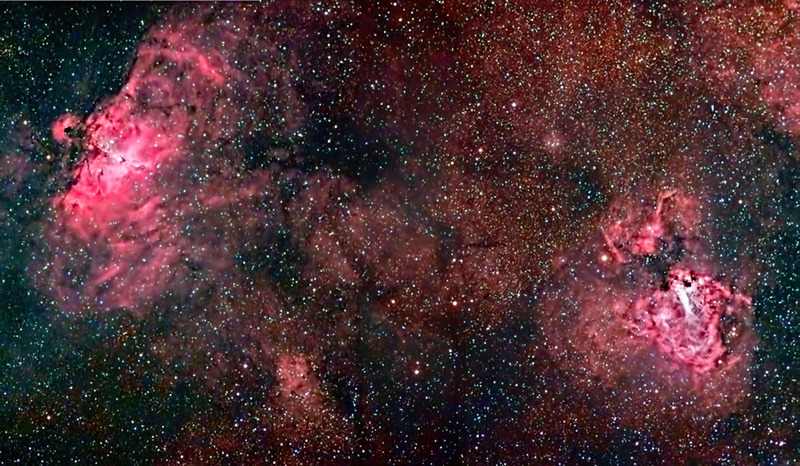 The mosaic was made in Photoshop after registering the two in RegiStar. The color images were converted from Raw format in Canon Digital Photo Professional. They were aligned and combined in ImagesPlus. The Ha and color images were aligned with RegiStar the final image was adjusted (Curves) in Photoshop. The Ha images were taken at the Nebraska Star Party (7/17/12) and my backyard observatory in southeastern Minnesota (7/22/12). The color images were taken at home on 8/7/12.